One lady who keeps proving that true sexiness is not about being slim but fat and curvy is none other than Toolz. 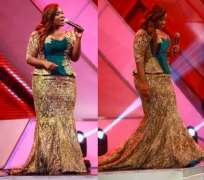 The host of the recently concluded Glo X Factor show, dawned this wonderful attire, looking big, bold and beautiful, to the grand finale of the event which took place on tuesday. Reminds me when this big and matured lady once claimed to be a virgin. Since her arrival from london to Beat Fm here in Nigeria, she has become the toast of every radio listeners as her male fans always wish to have a taste of her wonderful endowments. Toolz carry no be small.